At Rugs & More we carry a huge selection of rugs whether you are looking for a living room, bed room, or even a dining room rug. Rugs & More is recognized as the ultimate shopping destination for the world’s finest rugs. Our rugs are sourced internationally and are hand selected and surveyed to ensure the highest quality. Fall in love today with your area rug. A dining room rug can add comfort, style and color to your home. It also frames the dining room table making the whole room visually pleasing. But choosing the perfect rug can be a little tricky. It’s usually an investment, so we want to do everything we can to choose the right one! Before you include a rug to your dining room you want to rearrange your dining room furniture in the placement that you want it. Doing so will make it a lot easier to measure and pick out the right area rug for your space. Measure your dining room table and adding 20-30 inches. Now you have a the perfect size rug for your dining room. 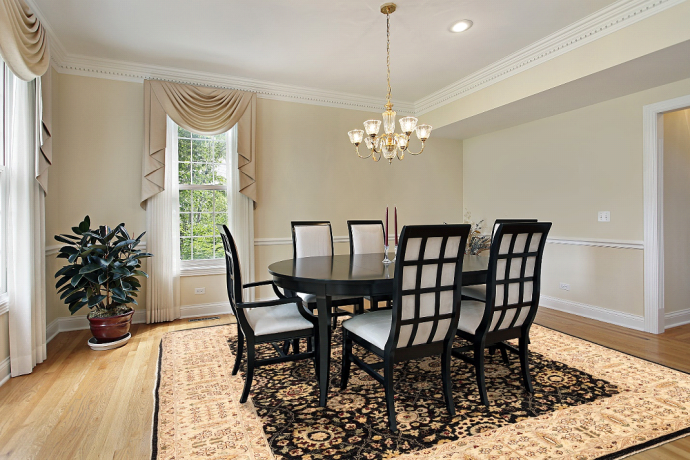 Make sure your rug is not so big that it covers your entire dining room. Let the edges of your room “breathe”! Make sure you have at least 6-18 inches of floor showing all the way around the room. This will define your eating space and supporting furnishings. Choose from Persian rugs, Antique rugs, Classical rugs, Modern rugs and much more. Your options are endless at Rugs & More when it comes to finding the perfect rug. Buy direct from manufacturer and save big on genuine, authentic, hand-knotted rugs.